The extreme heat on Sept. 26 left spectators and fans sweltering at the Maggie Gilbert Aquatic Center. 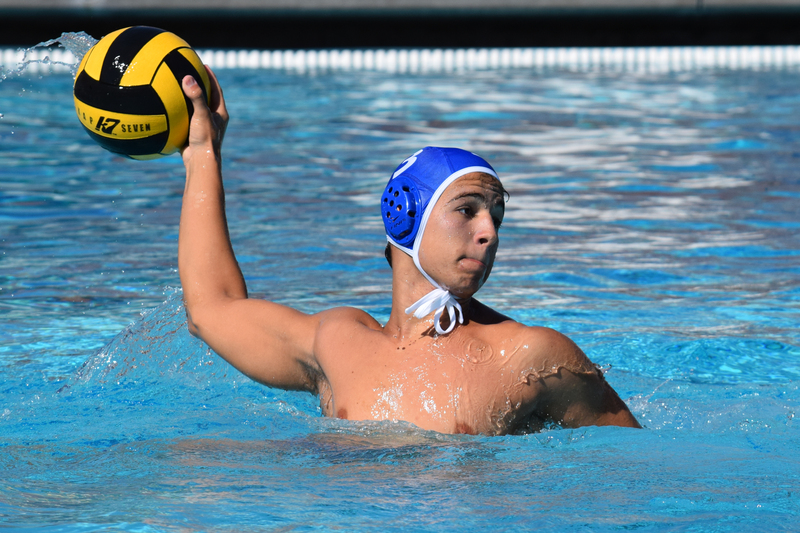 The only thing hotter that the weather was the Palisades High School boys water polo team as they demolished San Pedro 18-1. Alternating in goal, Brandon Epp had four saves and Michail Melnik had seven. Leading the scoring for the Dolphins was freshman Oliver Grant with six, senior Isai Elias had three and freshman Max Speiser and sophomore Zeke Ramirez each added two. Gabriel Feizbakhsh, Lucas Silva, Zach Wunder, Orson Spence and Theo Trask each scored a goal. Senior Lucas Silva takes a shot on goal. Watching his old team play was Zach Senator, now is a freshman at Pomona. He plays water polo on the college team and had come back to visit with his high school coach Adam Blakis and see his old teammates. Asked about the difference between high school and college play, “The guys are a little bigger, a little stronger and a little faster,” Senator said. In his first college tournament, Senator said his team beat Irvine and the Air Force team. “It’s fun and a good time,” he said. The JV team won 14-7.